The Kansas City Chiefs defeated the Green Bay Packers on Thursday evening, 33-21 continuing the fourth full week of preseason action in the NFL. After trading away Brett Hundley to the Seahawks, QB DeShone Kizer was metaphorically handed the keys to the backup position behind Aaron Rodgers. If this game was any indication, the Packers now have a big question mark if Rodgers goes down to injury again. Kizer still showed the issues he had a year ago where his accuracy deserts him such as his overthrown interception while Tim Boyle threw two costly interceptions including one returned for a touchdown. The box score stat sheet will say RB Aaron Jones had just 3.8 yards per carry but he worked for almost every yard as he averaged almost 3.0 yards per carry after contact, forced several missed tackles while making a couple of nice plays as a receiver. If the Packers want to get to the Super Bowl with Rodgers a few more times, the secondary is going to need to improve quickly from recent seasons. They’ve invested heavily in the position and the starters did an excellent job in the few snaps they played tonight as Jaire Alexander fought through a screen block for a TFL on a WR screen while Kevin King broke up a pass at the goalline to prevent a touchdown. Rookie Josh Jackson has now given up more receptions than he has interceptions this preseason as he allowed a sideline toe-tap catch. Jackson only played 13 snaps so he didn’t get much opportunity to add to his impressive stats this preseason but his play should push for a starting role sooner than later. 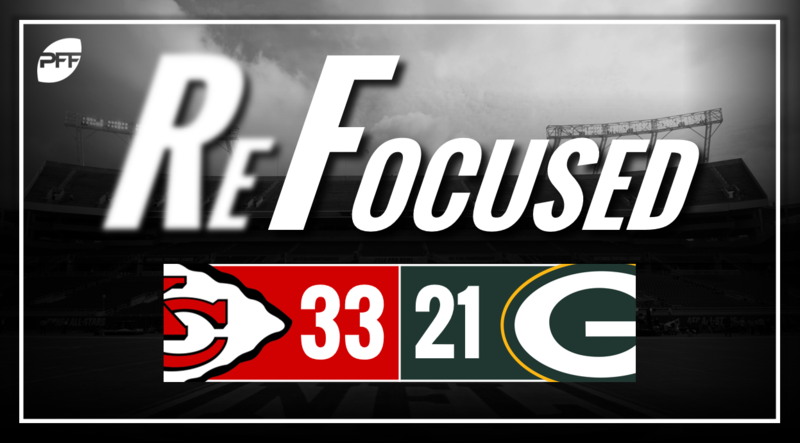 The Chiefs quarterbacks put together an all-around solid performance to combine for over 300 yards as they consistently targeted the Packers secondary beyond the sticks. Rookie Chase Litton did his best to impress the coaching staff and earn a roster spot with a couple of big-time throws while veteran backup Chad Henne played it safe averaging just 2.8 depth of target. Rookie Byron Pringle really impressed as a receiver and perhaps more importantly for him to earn a roster spot, on special teams as a returner. Pringle averaged a whopping 30.5 yards per reception as three of his four catches went for first downs. Rookie Armani Watts showed Kansas City fans why the Chiefs front office and coaching staff are high on the Texas A&M product as he hauled in two interceptions, both of the diving variety. Watts had issues as a tackler in college but if he can be the ballhawk the Chiefs believe he can be, he’ll pair well with Eric Berry. Second-year edge defender Tanoh Kpassagnon was held in check in his limited time against Green Bay but he’ll need to do better than five pressures he recorded in 2017 to a Kansas City pass-rush unit that graded as the fifth worst in the NFL. Green Bay: The Packers backup quarterbacks struggled for most of the night and when a team can’t get their passing game going, it ends up being a long night on the losing end of the battle. Kansas City: Watts and Makinton Dorleant combined for three interceptions with Dorleant returning his for a touchdown. The Packers were unable to overcome these turnovers.